Our Team consists of a diversity of individuals and personalities; however, we all have one thing in common and that is to be an advocate for your pet's health care and well being. Our doctors have interests in different areas and that allows us to consult with one another on challenging cases. We also feel that our pets benefit from traditional and integrative medicine. We offer laser therapy and rehabilitation. 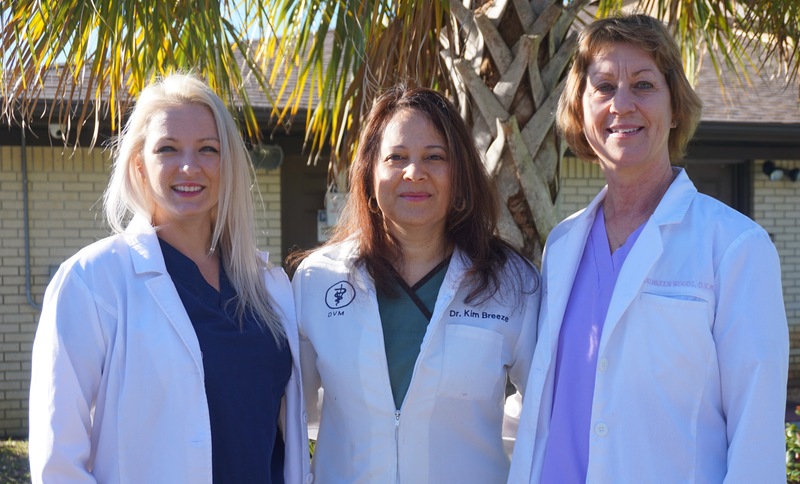 We have team members that have been with us for over a decade, they are very dedicated to the animal health field and active in the community. We provide medical care for our local wildlife and work closely with Kritters Inc. for their rehabilitation and hopefully release back into the wild. We providing health care for Bay County Humane Society and Animal Rescue Center (ARC). Please consider adopting your next pet from a shelter or rescue center and save a life! Visit our staff page and get to know us. Frontline Plus kills 100% of adult fleas on your pet within 18 hours. Rimadyl is a non-steroid antiinflammatory used to treat pain. Purina Veterinary Diets® EN GastroENteric® are formulated to provide complete and balanced nutrition. Heartgard is a real-beef chewable tablet that provides protection against heartworms. Vetmedin is a cardiac drug used to treat dogs with congestive heart failure. Pill Pockets are healthy treats that take the hassle out of medicating pets in three simple steps. - My pride & joy! !